The most popular and comprehensive book on Swift algorithms & data structures! This 23-chapter book covers search (breadth-first, depth-first, Dijkstra’s), sort (mergesort, radix sort, heap sort, and quicksort), trees (binary trees, AVL trees, binary search trees), stacks, graphs, and more. Learn how to implement the most common and useful data structures and algorithms in Swift! Understanding how data structures and algorithms work in code is crucial for creating efficient and scalable apps. Swift’s Standard Library has a small set of general purpose collection types, yet they definitely don’t cover every case! In Data Structures and Algorithms in Swift, you’ll learn how to implement the most popular and useful data structures, and when and why you should use one particular datastructure or algorithm over another. This set of basic data structures and algorithms will serve as an excellent foundation for building more complex and special-purpose constructs. As well, the high-level expressiveness of Swift makes it an ideal choice for learning these core concepts without sacrificing performance. You’ll start with the fundamental structures of linked lists, queues and stacks, and see how to implement them in a highly Swift-like way. Move on to working with various types of trees, including general purpose trees, binary trees, AVL trees, binary search trees, and tries. Go beyond bubble and insertion sort with better-performing algorithms, including mergesort, radix sort, heap sort, and quicksort. Learn how to construct directed, non-directed and weighted graphs to represent many real-world models, and traverse graphs and trees efficiently with breadth-first, depth-first, Dijkstra’s and Prim’s algorithms to solve problems such as finding the shortest path or lowest cost in a network. Data structures are a well-studied area, and the concepts are language agnostic; a data structure from C is functionally and conceptually identical to the same data structure in any other language, such as Swift. At the same time, the high-level expressiveness of Swift make it an ideal choice for learning these core concepts without sacrificing too much performance. Before you dive into the rest of this book, you’ll first look at a few data structures that are baked into the Swift language. The Swift standard library refers to the framework that defines the core components of the Swift language. Inside, you’ll find a variety of tools and types to help build your Swift apps. A linked list is a collection of values arranged in a linear unidirectional sequence. A linked list has several theoretical advantages over contiguous storage options such as the Swift Array, including constant time insertion and removal from the front of the list, and other reliable performance characteristics. The stack data structure is identical in concept to a physical stack of objects. When you add an item to a stack, you place it on top of the stack. When you remove an item from a stack, you always remove the topmost item. Stacks are useful, and also exceedingly simple. The main goal of building a stack is to enforce how you access your data. Lines are everywhere, whether you are lining up to buy tickets to your favorite movie, or waiting for a printer machine to print out your documents. These real-life scenarios mimic the queue data structure. Queues use first-in-first-out ordering, meaning the first element that was enqueued will be the first to get dequeued. Queues are handy when you need to maintain the order of your elements to process later. The tree is a data structure of profound importance. It is used to tackle many recurring challenges in software development, such as representing hierarchical relationships, managing sorted data, and facilitating fast lookup operations. There are many types of trees, and they come in various shapes and sizes. In the previous chapter, you looked at a basic tree where each node can have many children. A binary tree is a tree where each node has at most two children, often referred to as the left and right children. Binary trees serve as the basis for many tree structures and algorithms. In this chapter, you’ll build a binary tree and learn about the three most important tree traversal algorithms. A binary search tree facilitates fast lookup, addition, and removal operations. Each operation has an average time complexity of O(log n), which is considerably faster than linear data structures such as arrays and linked lists. In the previous chapter, you learned about the O(log n) performance characteristics of the binary search tree. However, you also learned that unbalanced trees can deteriorate the performance of the tree, all the way down to O(n). In 1962, Georgy Adelson-Velsky and Evgenii Landis came up with the first self-balancing binary search tree: the AVL Tree. The trie (pronounced as “try”) is a tree that specializes in storing data that can be represented as a collection, such as English words. The benefits of a trie are best illustrated by looking at it in the context of prefix matching, which is what you’ll do in this chapter. Binary search is one of the most efficient searching algorithms with a time complexity of O(log n). This is comparable with searching for an element inside a balanced binary search tree. To perform a binary search, the collection must be able to perform index manipulation in constant time, and must be sorted. A heap is a complete binary tree, also known as a binary heap, that can be constructed using an array. Heaps come in two flavors: Max heaps and Min heaps. Have you seen the movie Toy Story, with the claw machine and the squeaky little green aliens? Imagine that the claw machine is operating on your heap structure, and will always pick the minimum or maximum value, depending on the flavor of heap. Queues are simply lists that maintain the order of elements using first-in-first-out (FIFO) ordering. A priority queue is another version of a queue that, instead of using FIFO ordering, dequeues elements in priority order. A priority queue is especially useful when you need to identify the maximum or minimum value given a list of elements. O(n²) time complexity is not great performance, but the sorting algorithms in this category are easy to understand and useful in some scenarios. These algorithms are space efficient; they only require constant O(1) additional memory space. In this chapter, you'll be looking at the bubble sort, selection sort, and insertion sort algorithms. Merge sort is one of the most efficient sorting algorithms. With a time complexity of O(log n), it’s one of the fastest of all general-purpose sorting algorithms. The idea behind merge sort is divide and conquer: to break up a big problem into several smaller, easier to solve problems and then combine those solutions into a final result. The merge sort mantra is to split first, and merge after. In this chapter, you’ll look at a completely different model of sorting. So far, you’ve been relying on comparisons to determine the sorting order. Radix sort is a non-comparative algorithm for sorting integers in linear time. There are multiple implementations of radix sort that focus on different problems. To keep things simple, in this chapter you’ll focus on sorting base 10 integers while investigating the least significant digit (LSD) variant of radix sort. Heapsort is another comparison-based algorithm that sorts an array in ascending order using a heap. This chapter builds on the heap concepts presented in Chapter 12, “The Heap Data Structure”. Heapsort takes advantage of a heap being, by definition, a partially sorted binary tree. In the preceding chapters, you’ve learned to sort an array using comparison-based sorting algorithms, merge sort, and heap sort. Quicksort is another comparison-based sorting algorithm. Much like merge sort, it uses the same strategy of divide and conquer. In this chapter, you will implement Quicksort and look at various partitioning strategies to get the most out of this sorting algorithm. What do social networks have in common with booking cheap flights around the world? You can represent both of these real-world models as graphs! A graph is a data structure that captures relationships between objects. It is made up of vertices connected by edges. In a weighted graph, every edge has a weight associated with it that represents the cost of using this edge. This lets you choose the cheapest or shortest path between two vertices. In the previous chapter, you explored how graphs can be used to capture relationships between objects. Several algorithms exist to traverse or search through a graph's vertices. One such algorithm is the breadth-first search algorithm, which can be used to solve a wide variety of problems, including generating a minimum spanning tree, finding potential paths between vertices, and finding the shortest path between two vertices. In the previous chapter, you looked at breadth-first search where you had to explore every neighbor of a vertex before going to the next level. In this chapter, you will look at depth-first search, which has applications for topological sorting, detecting cycles, path finding in maze puzzles, and finding connected components in a sparse graph. Have you ever used the Google or Apple Maps app to find the shortest or fastest from one place to another? Dijkstra’s algorithm is particularly useful in GPS networks to help find the shortest path between two places. Dijkstra’s algorithm is a greedy algorithm, which constructs a solution step-by-step, and picks the most optimal path at every step. 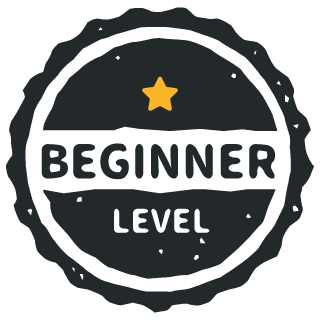 In previous chapters, you’ve looked at depth-first and breadth-first search algorithms. These algorithms form spanning trees. In this chapter, you will look at Prim’s algorithm, a greedy algorithm used to construct a minimum spanning tree. A minimum spanning tree is a spanning tree with weighted edges where the total weight of all edges is minimized. You’ll learn how to implement a greedy algorithm to construct a solution step-by-step, and pick the most optimal path at every step. In addition to all the above theory chapters, you’ll also get challenge chapters to test your knowledge of the data structures and algorithms contained in the book, along with a full set of solutions with code. From baked in Swift data structures, to implementing COW, if you want to level up your Swift and get ready for that coding interview, Data Structures and Algorithms in Swift will help you do it. It covers everything from linked lists, stacks, trees, graphs and of course a multitude of sorting algorithms for your daily data structure need. If you are are looking for an iOS developer job or just want to revisit those complex algorithms, this is what you are looking. It's amazing the amount of details this book provides on every explanation. It's a very easy to read and an amazing tool to have. Whether you want to ace your next coding interview, or use Swift successfully in competitions on HackerRank, or want to make sure your Swift code is well designed and scalable, this is the right book for you. 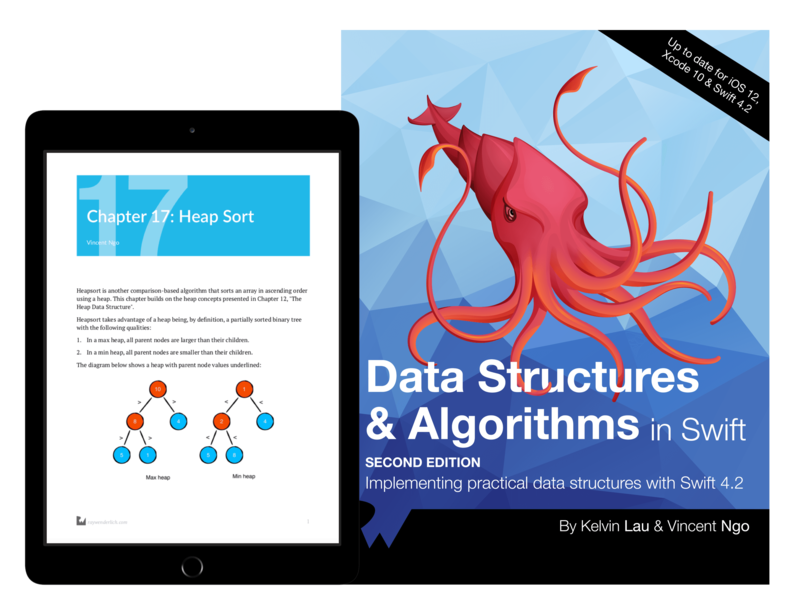 The authors explain data structures and algorithms with diagrams and examples and explain the Swift code implementation step by step.